Caption slip reads: "Photographer: Jensen. Date: 1958-05-01. Assignment: Pittsburgh. A-1, A-2: Don Newcombe pitches to Groat, first inning. J-112: Kluszewski hits line drive to Neal at second base. Note: Newcombe ducking out of way of ball, second inning. 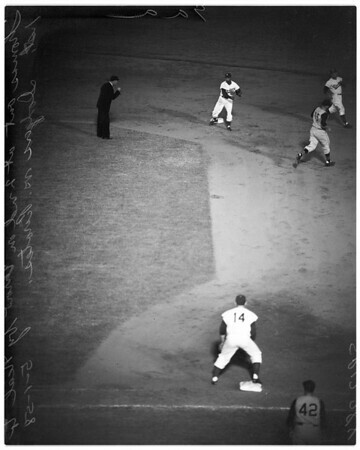 A-3: Don Newcombe hits single, first Dodgers hit, second inning. A-4: Duke Snider. A-9: Thomas out at second on throw by Neal to first, getting Mejias for double play, seventh inning".